As I promised in my latest article entitled “Giving Negotiation a Fair Chance”, this article provides a glimpse into the plausible alternative futures of Ethiopia. My latest article got both positive and negative feedbacks. Some people misunderstood my suggestion and considered it as an effort to extend the ethnic apartheid rule of TPLF. This is regardless of a clear statement in the article that hinted the kind of negotiation I was talking about. I wrote in that article, “Rather than admitting defeat, saying sorry for their mistakes, and coming to the negotiation table for a win-win concession including giving the governing power to the people peacefully, they are attempting to scam the people of Ethiopia one more time.” TPLF lost credibility long time ago. What is more? In recent months, it also lost governing ability. It has become apparent to the people of Ethiopia, TPLF and its supporters (unless they are pretending otherwise) and the whole world that it can’t rule the country without using force. This cannot go on forever. No one could be able to salvage TPLF without it making fundamental changes that could satisfy the majority Ethiopians. The negotiation I was talking about should result in transferring governing power to the people of Ethiopia without further bloodshed. It should also lead to national reconciliation and consensus, which I suggested in the interview I had with Voice of America on September 2, 2016. If TPLF leaders come to the negotiation table, stop killing immediately, and willing to allow the people of Ethiopia elect their own leaders in a free and fair election (on purpose, I’m not talking here how the transition should be setup, we have time to deal with that once there is agreement to settle the issue via negotiation), they should be given amnesty and some other limited privileges including living inside the country like everybody else. We Ethiopians deep inside are spiritual and forgiveness is not new to our culture. We have elderly people who can lead a win-win negotiation. If necessary, we have great African, American, and European friends of Ethiopia who are well respected by our community. They may join our elders and force a few TPLF leaders, and those in the opposition camp to reach a win-win deal. I’m sure that many may cry out and say that we cannot forgive criminals who ordered and also killed innocent people. It is sad that some ruthless criminals have killed our people but we cannot bring them back by continuing to fight. More people are going to die and still we are not sure whether we could bring a lasting and sustainable change through violence. But, at least, their sacrifices won’t be in vain if we could be able to stop further killings and bring lasting change in our country through a win-win negotiation. If we forget the rest of the world, within Africa itself, there are a couple of cases where dictators who had killed and looted the treasures of their countries were forgiven because they negotiated and relinquished power peacefully. The South Africans’ peaceful transition from Apartheid to democracy is also a good example. We don’t need to copy and paste. We could customize them to fit the objective conditions in Ethiopia. Once I clarified the kind of negotiation I’m talking about, let me use a tool and show you the four possible alternative futures of Ethiopia. However, I’ve a very quick disclaimer: The foresight tool I’m going to use works best when a reasonable number of key stakeholders are present during the brainstorming session. Hence, this article doesn’t endeavor to predict the most probable future. It doesn’t also pretend that the assessments and suggestions in this article are accurate and comprehensive. I’m trying to show case the importance of anticipating alternative futures, trying our best to create the future we all dream of, and preparing ahead if in case our most preferred future doesn’t come to pass. The father of modern Management, Peter Drucker said, “The best way to predict the future is to create it.” Unfortunately, many communal cultures like ours are past-oriented. They don’t project into the future to shape their future. There are many cultural, religious, and traditional factors that discourage such an exercise. This is my hope that you may read this article with an open mind before you dismiss it. The main purpose of this article is to provoke your thought and challenge your perspective if in case you have been thinking that we are going to have your one future. The end goal is to encourage alternative democratic forces to think, strategize, develop their capacity, and shape the future we all dream about. Before we proceed, I would like to share with you a relevant story to illustrate how many of us don’t sit down and analyze things. It demonstrates how we are prone to believe anything as far as it aligns with that one future we’ve in mind. This weakness has been costing us direly. Rather than being proactive to shape our future, analyze trends, project into the future, we wait to see if what we dreamed about comes to pass. Here is a simple example. A couple of weeks ago, a friend of mine emailed me a link. On the subject, it says, TPLF is retreating. I didn’t believe the news for a second but I was curious; and thus, checked out the link. Guess what? It was reported that TPLF is withdrawing from Addis to Tigray with tail between legs. A picture that shows large military trucks lined up accompanies the breaking news. Still, I wasn’t convinced not because I don’t want to see TPLF is gone but the scenario was unlikely. Coincidently, I had a business call from someone later that afternoon. The person who called me sounded like hundred percent sure that TPLF is evacuating. I asked him whether his conclusion came just because he saw a report online. He said no and assured me that he has latest insider info. You don’t have many options when someone argues that he/she has insider info except to wait and verify if that was true. We waited, and what happened? Nothing! I’m sure that many people who read that breaking news might have taken it at face value. On the other hand, I don’t think that I’m the only one who doesn’t buy into this kind of too good to be true news. Why? It’s simple. At this point, TPLF has its military, security, and the federal police intact. They still control the media, and enjoy some local, regional, and international backing from some key regional and international allies. Why then should they run away? Who is chasing them? Besides, how on earth do they think that Tigray is going to be a save heaven? There are also many other reasons that should have caused us to question whether we are going to see this kind of scenario at all. The question is why many people get easily swayed and believe in such unlikely scenario? It could be because they have been waiting to see the end of this brutal government’s demise so long that they are vulnerable to believe anything that aligns with their deeply held wish. Or, it could be because they don’t take time to analyze things and be clear about the possible scenarios that could happen. When we deal with the future, we should put aside our emotion, and be practical. We should also project into the future and anticipate multiple possible futures that could happen and prepare for the most probable future. But still, be ready in making quick adjustments if another future comes to pass. Let me ask you. What do you think is going to happen, let’s say, in 6 months or 1 year or 10 years from now? What should we be doing NOW to shape our future, a future that we dream about? If we don’t act proactively and shape our future, we make ourselves vulnerable and let ourselves under the mercy of chance. This weakness predisposed us to get the same results again and again. Twice, our struggles to bring democracy, justice, and equality were kidnapped by a few and we have been in miserable state for the past more than four decades. When do we learn to stop and strategize, plan, and be proactive to protect the outcome of our struggle? Unless we change our approach this time, there is no guarantee that we would have a better Ethiopia than that has been ruled by two brutal, socialistic, and unworthy leaders of this historic country and its beautiful, heroic, and generous people. Let me use a tool that I’ve been using when I facilitate strategic planning sessions. The purpose of this exercise is to encourage leaders in the opposition camp consider employing this tool to come up with a long-term strategic plan. This latest and powerful tool has been used by some successful organizations worldwide. This foresight tool is called Scenario Planning. It enables us to make sense of the uncertain future by creating scenarios (narrative stories) that offer contexts for decision makers to make the right decisions. Strategies based on these decisions most likely succeed compared to decisions and strategies based on sole predictions. I don’t take your time by explaining the process and how it works in detail. In short, key knowledgeable players should come in one room for a strategic session to scan the environment and brainstorm to identify drivers of change that influence their organization in the future. After thorough discussion and examination of major trends (social, economic, political, regional and international geopolitical trends, etc.) that may take a couple of days, the group decides two critical uncertainties that are most uncertain and at the same time most critical that will have impact on the organization. They then build the scenario matrix with four future worlds. They then come up with scenarios (stories) to describe each future. The next step is developing strategies and coming up with approaches to develop the competency of the organization to realize the most probable future. The group also asks what happens if this future doesn’t come to pass? Accordingly, they come up with contingency plans for the remaining three plausible alternative futures. The main thesis behind this approach is that we cannot accurately predict the future. Do you remember some outrageous predications that were made in the past like the year and date the world ends? What happens when you have depended on a predication that doesn’t come to pass? You find yourself disappointed and stranded. You haven’t prepared for the other possible futures. We Ethiopians have predicted the fall of TPLF so many times and got disappointed multiple times. We never prepared proactively to shape the preferred future we desired desperately. When the future we anticipated tend to slip away, we didn’t know how to react. We looked like a deer caught in the headlights. This must change this time. Don’t you think? We must stop gambling on our future, the future of the coming generations, the lives of thousands of people, and our limited resources because we don’t want to be proactive and identify the preferable future we all agree, and work toward realizing this FUTURE. Let me quickly put forward the four possible futures for the sake of understanding. Remember, this is an example. The process has to be done properly with the participation of decision makers and a skillful facilitator to be successful. In our case, going forward, we are not certain whether the struggle keeps its momentum or some how gets bogged down and wanes (X-axis). 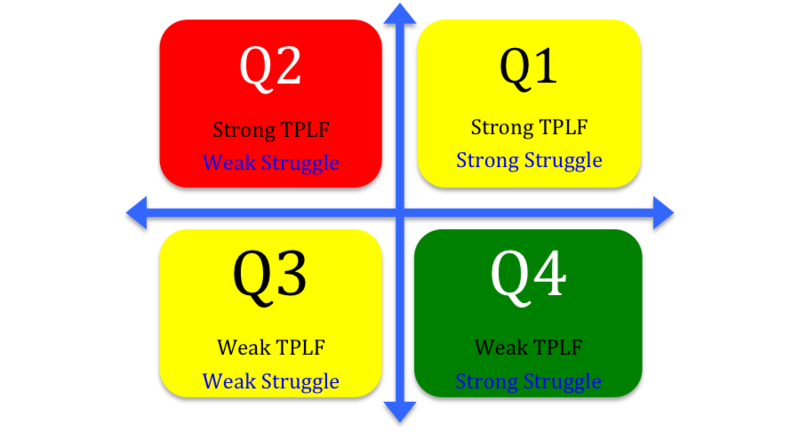 Likewise, we are uncertain whether TPLF keeps outlasting the resistances it is going to face around the country or weakens (Y-axis). When we intersect these two uncertainties, we find four futures that could come to pass in the future (Please refer the graph below). 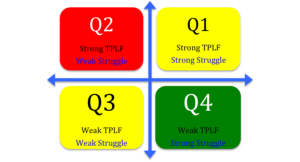 Future 1 (Quadrant 1, Q1) could be one possibility where TPLF may remain strong and at the same time the struggle continues to maintain its momentum. Future 2 (Q2) could be another alternative future where TPLF may remain strong while the struggle weans. Future 3 (Q3) could be the third alternative future where both sides may experience stagnation. Future 4 (Q4) could be another alternative future where the struggle keeps growing while the ability of TPLF to survive weakens. So far, TPLF has been lucky since it has survived a couple of tough challenges and came out a winner. This time will it get lucky? What happens if the future that comes to pass would be Q4? TPLF won’t have the leverage, and therefore, we know what is going to happen if that future arrives. Likewise, the people of Ethiopia have been experiencing setback after setback. Will we, this time, come out victorious? But, what if the future that comes true is Q2, this time too? Obviously, the struggle won’t have any strong leverage and therefore, we don’t get any benefit we would have got right now if we negotiate. Since both have some kinds of leverages right now, this is the right time to find a sustainable solution for our country by coming to the negotiation table for a win-win solution. As you can see from the above graph, the best scenario for TPLF is Q2 while Q4 is the most preferred future for the struggle toward freedom, democracy, and equality. As I indicated earlier, both sides are focused on their preferred future. It’s important to notice that even if one of the two futures comes to pass, that doesn’t mean they are the best for the corresponding camp. Even if, for whatever reason, Q2 is that future, that doesn’t mean that TPLF will have hay days forever. The struggle may be weakened for a while and in its dormant state. This temporary victory may not last. The popular movement may be boiling under the surface and one day it may explode to overwhelm TPLF and bring into picture Q4. Likewise, the realization of Q4 doesn’t mean the people of Ethiopia will get what we want and deserve. The opposition camp is not well organized, and thus, there would be power vacuum. We Ethiopians, though we have come together in the fight against TPLF, we have not reached consensus about the kind of Ethiopia we want to build in the post TPLF era. Don’t take this scenario lightly. Don’t just say that we can come together and reach consensus once TPLF is gone. That cannot happen considering our political culture. In this future (Q4), the people of Ethiopia, like in the past, may not have the say. This situation makes us susceptible to coup d’état from within TPLF itself or the overthrowing of TPLF by armed forces out side of TPLF. From our history, both scenarios didn’t end well. These kinds of groups feel entitled. They may not relinquish power and give it to a civilian government. Okay, both sides may say, I’ll wait and see. I’ve 50% chance in getting my preferred future than entering into a negotiation at this point. I wouldn’t bet my destiny for a 50% chance. I’d prefer to negotiate and get a better deal than to wait and allow chance to dictate my destiny. What is worst in this case is that there are four plausible alternative futures, and the chance to get what you want has a 25% chance. Think about it. The question is what happens, if that future doesn’t come true? What happens if both sides become strong or weak at the same time? What happens if either Q1 or Q3 comes to pass? Either case, no one wins, and therefore, we may be in trouble as a society. Right now, I don’t think that either side anticipates the coming picture of either of these two alternative futures. For instance, if Q1 is the world that we are going to face in the future, there could be civil war and/or genocide plus so many unpredictable things may happen. Ethiopia may disintegrate and we won’t have a country to look forward to in the post TPLF era. Q3 is also a possibility where both sides are weakened. In this future, our country is going to drag herself into a chronic and protracted conflicts and instabilities in the different parts of the country which in turn may result in financial hardships, famine, epidemics, and so on. Of course, the future may not stay in one quadrant for a very long time. It may change lane and find itself from those two quadrants both parties aren’t prepared (Q 1 & 3) into one of the other quadrants. For example, if TPLF outsmarts oppositions during either of the two worlds (Q 1 & 3) and able to win back the public by making fundamental changes, the future may change from Q1 or Q3 into TPLF’s favorable world- Q2. Or, the struggle may rejuvenate and outmaneuver TPLF and rally the public, and thus, the world may change from Q1 or Q3 into Q 4. What I’m saying is that none of us could be able to predict the future. That is why we should think harder while it still matters. This is the time to establish a very powerful lesson to this and the coming generations. Let’s come to the negotiation table and develop a win-win solution that satisfies all sides, and transition our country into democracy. Nevertheless, I’m not naïve. Negotiation cannot be possible until leaders of the ruling party are ready to come to the negotiation table for a win-win solution, and most importantly, unless they are ready to make serious concessions. We don’t have control over that. That means negotiation may not be possible with the current regime. In that case, the alternative democratic forces should come together, create a coalition, be a little bit organized and project into the future and work toward creating the future that we the people of Ethiopia prefer- Q4. However, you shouldn’t stop there. You should develop your capacities and put in place contingences if in case one of the other three alternative futures comes to pass. You shouldn’t find yourselves disappointed and stranded if in case the one future you anticipated doesn’t come true. You should prepare for the long haul fight by crafting both short and long-term strategic plans that prepare you in advance for whichever future comes to pass. Good luck!